Today’s post is a flashback/comparison of one area of the Harwood Historic District. The image below merges a historic photo with a modern view, similar to others on Flickr’s “Looking Into the Past” collection. Looking west down the 1900 block of Elm Street from Harwood Street, this stretch of downtown was historically known as Theater Row (today the Majestic Theatre is the only theater that escaped demolition). Insensitive additions — such as the utilitarian Majestic Garage and skybridge spanning Elm Street — have erased many of the small structures that created a vibrant commercial district. Some of the surviving structures, such as the Titche-Goettinger building, have been repurposed as residential lofts. 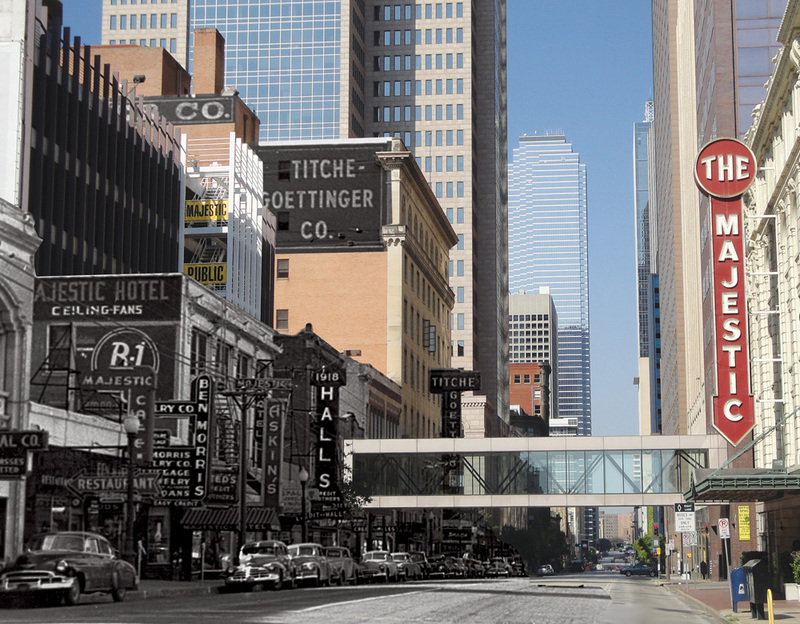 2 Responses to "Elm Street Then and Now"
In 2003 I wrote “Street of Dreams, A History of Dallas’ Theatre Row” documenting in detail all of the movie theatres that were downtown as well as a history of entertainment in Dallas. There were lists of the theatre organs in many of the theatres as well as the organists who played them. This was a book I had thought about for years and am so glad it was done. Many people were interviewed who either worked in the theatres or who had memories of going to them. The book sold out quickly. The photos for the most part were furnished to me by many movie theatre & history enthusiasts. Some now are deceased and I’m doubly glad their interviews are in the book. Thanks so much to all of the contributors to this website. I would like to know if Sue Moorman is mentioned in your book? Sue was a Dallas organist from 1945 to 1963.